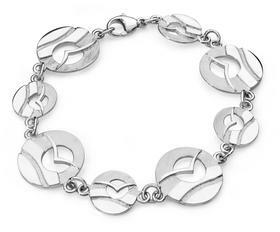 Celtic Coastline Silver Bracelet : LOVE2HAVE in the UK! An excellent Celtic sterling silver bracelet for a beach or coastal holiday. The beautiful coasts of the world are well known for the sounds of the ocean waves and the seabirds. The design for this bracelet inspired by gulls swooping above the sea reflects the natural rhythms of the shores echoing the wild seabirds, hovering and circling above the ocean. The bracelet is a link style design consisting of eight circular pieces fashioned with undulating wave shapes with a seabird outline sitting proud of a grainy textured sky. Small silver links join the circular pieces together and It comes with s secure lobster clasp. The total length is 20cm as standard, but other sizes are available on request. 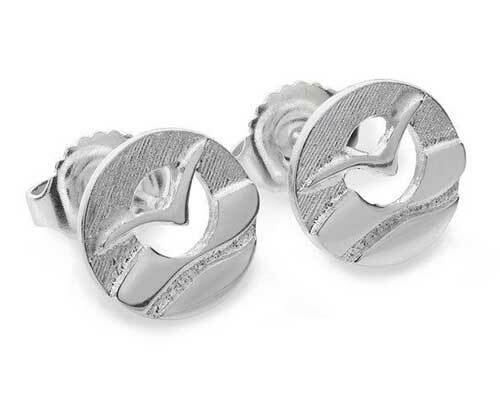 Matching earrings available too.